Windows has a lot of cons but it has also some pros. One of them is a smooth way to create empty file on right-click. Mac OS doesn’t come with this feature by default, but you can integrate it with just one line of code… Or you can download New File Menu Free created by Coral Wu. 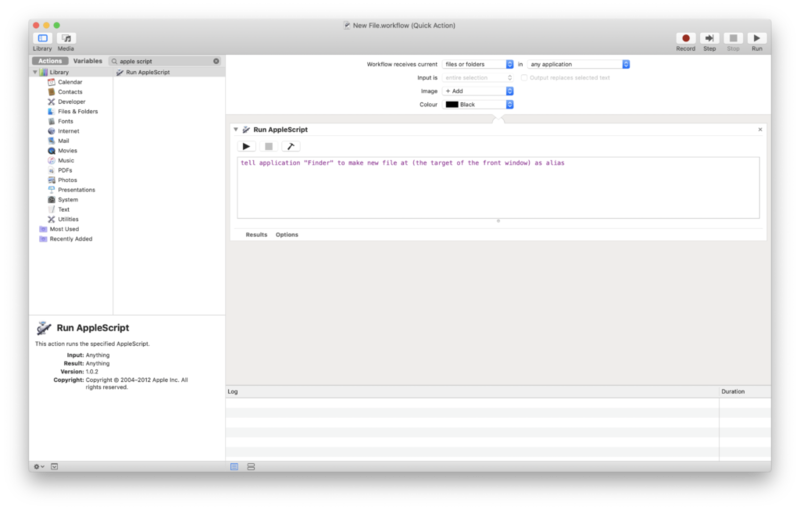 Open “Automator.app” , which is installed on you mac by default. Then you click File -> New or with keyboard shortcut ⌘N. Choose Quick Action as a type for your document. Now under Library -> Utilities double click or drag from left pane Run AppleScript. Now when you right-click on file/folder you should see + New File option under Quick Actions menu. Can’t do it yourself? Don’t worry you can download New File Menu Free created by Coral Wu.